The formatting of this book is very unique, perhaps more so than other novels that can also claim the unique formatting title. The first page of the book is a message from someone compiling a report on the Kerenza Disaster, a full scale attack on the not quite legal mining colony of Kerenza. We have emails and instant messaging conversations between the characters. There’s security camera footage and recorded conversations. There are mission reports and other formal reports to higher ups on the ship. Some great commentary is added into the margins in places by the supposed compiler of the text. The page design is beautiful, and there are some very wonderful graphics. This is definitely a book you want to experience in its physical form as opposed to an ebook. A lot of work was put into making this book look perfect, and I really think the publisher and authors nailed it. Some sections are made to be seen over two pages, and I can’t image them translating very well to an e-reader. There are a few sections where the text follows a curving, whimsical pattern against a starry background. While very beautiful and well suited to the text as a whole, it does require some neck craning and book turning to actually read. What I feel most conflicted over was the decision to black out all curse words. The very first page makes mention of this, the compiler commenting on the logic behind it. This gets very old very quickly. Ezra and Kady, the main characters, feel very much like high schoolers. The characters retain aspects of their age throughout the story while growing considerably, and quickly. Given the circumstances, this is of little wonder. Both had their home destroyed and lost family members. Ezra was conscripted into the military due to a lack of manpower and the encroaching enemy ship still intent on destroying them. Kady sticks with what she does best – hacking – while looking for answers the higher ups are determined to keep hidden. The vast majority of the dialogue between Kady and Ezra is through instant messaging, and the dialogue reflected this. I think it’s universally true that when we use instant messaging or text messaging we speak a bit differently than we would aloud, or even in an email. This is true here as well. It feels like two teenagers who know each other very well talking through instant message. This makes it feel very real. On the other hand, there were a few times when it got a little irritating. If you think this will annoy you to no end, be forewarned. To be honest, it did take me a little while to really get into the story. I didn’t feel terribly connected to the characters at first. Despite being in the middle of a disaster, there is still a good amount of focus on the shattered first love between Kady and Ezra. And while this makes sense – life goes on, after all, even during times of immense hardship and especially when your lost love is the only thing left to hold on to – I was more interested in the destroyed colony, giant spaceships, and impending doom than romance. And on that front Illuminae definitely delivers. I really liked the way Illuminae portrayed the slow chase. Tension built up along with a very real sense of helplessness and dread. The enemy was a real, ever constant threat, and interstellar battles well timed. The real action starts around the halfway point. And once it starts, it doesn’t let up until the very end. Despite the breakneck pacing and high action within the second half of the book, the character development is still treated with extreme care. I grew to love both Ezra and Kady. The more minor characters are also treated with that same amount of care. I found myself growing rather attached to the pilots Ezra works with, the hackers Kady worked with, and even the AI. The ship Alexander’s AI has very real character development. Though I’ve seen the concept of a rogue AI before, this novel did a truly exceptional job in its portrayal. The rogue AI is one of the best, most frightening AI’s I’ve ever seen in books, anime, or other media and also has, perhaps, the most character development out of the entire cast. The error messages as it speaks aloud and thinks to itself were great added touches. Despite the very long journey, I did feel like we needed just a little more time with the characters at the end. After all the high octane, edge of your seat action for well over a hundred pages, we really could have used a little time to cool down without the story just ending. 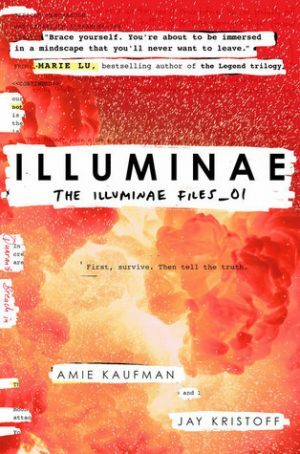 Illuminae by Amie Kaufman and Jay Kristoff is an edge of your seat young adult science fiction novel. Despite any issues I may have had with it, I truly enjoyed this book, especially the second half, and am planning to grab a copy of the sequel, Gemina, as soon as possible. If you enjoy young adult or science fiction, definitely give this series a try. If you like books told through alternative formatting, definitely give this one a go. I loved this book. The second book is also awesome and also goes at breakneck pace once the action starts. Yeah, the layout of the book adds another dimension to the experience, doesn’t it? Jay did art-something for a company for years (art director? can’t remember) and he had input and final say in layout. 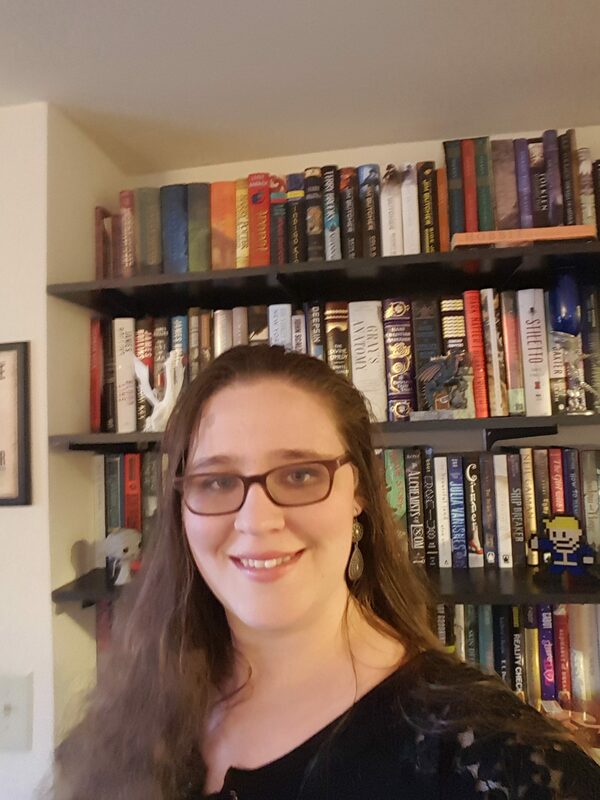 I know this cause I went to a signing for Gemina a couple of months ago.